“Growing up, my granny used to say ‘What’s for you won’t go by you, just you wait, you’ll thank me in years to come’. She was certainly right when it comes to my involvement with Volunteering Matters and the Clackmannanshire Befriending Project! For a while now, I have wanted to make a difference to something and someone else but I never really knew where to start. In early 2018 I was going about my day job as a Contact Centre Team Manager and although I enjoy it, I realised that I needed to do “more” for myself and I wanted to be “more” – whatever that meant. Initially my goal was to pick up from where I left off years ago: pursuing a career in teaching. To do this, I knew that I needed more experience with young people and volunteering seemed to be the perfect fit! I could fit it around my working life, help another person and the experience would also help me get to where I wanted to be. Two birds, one stone! When I discovered the Clackmannanshire Befriending Project, I knew immediately that it was exactly what I had been looking for. I literally was counting down the days until I could get started. The training sessions covered everything from the basics through to our biggest worries – with some group tasks and a few games thrown in for good measure. There were other volunteers from all walks of life and it was a great opportunity to meet new friends and colleagues. 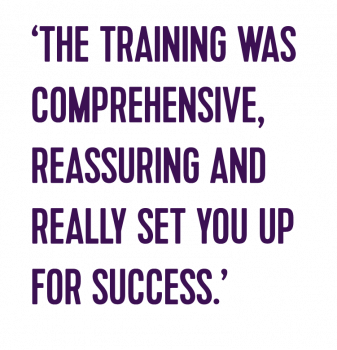 The training was comprehensive, reassuring and really set you up for success. Then came the thrilling part – being ‘matched up’ with a young person and meeting them for the first time. Finally, I was able to start doing the ‘more’ that I had wanted to do in forever. As soon as I met the young person and her mum, I knew it was the most perfect of perfect matches. We have so much in common, including our shared love of animals, ‘The Greatest Showman’, singing, dancing plus lots more. Unfortunately my young person has not had the easiest start in life. She can be incredibly anxious and this means that meeting new people and going to new places is a real challenge for her. She isn’t able, at the moment, to attend mainstream school five days per week. It was, and is still a case of building her confidence by doing activities that she is familiar with but at the same time trying to take her out of her comfort zone, slowly but surely. We are now a few months into our befriending relationship and it is going so well. Through befriending, she has already achieved some things that she had never done before. 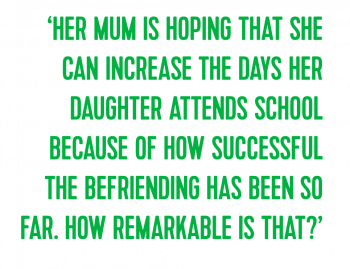 Her mum is in awe of the difference the project is delivering and is hoping that she can increase the days her daughter attends school because of how successful the befriending has been so far. How remarkable is that? As for me, this is my ‘more’ and it has totally exceeded my expectations. I feel that I am making a real difference just by investing a few hours volunteering every fortnight. I hope that over the next 12 months I can help my young person to really flourish into a more confident, happier young girl.